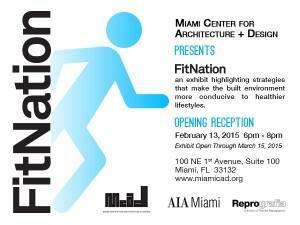 FitNation Exhibit Opening & Lively Steps | Miami Center for Architecture & Design, Inc.
From Brooklyn to the Bronx, from San Antonio to Cincinnati, communities and organizations across the United States are tackling heart disease, obesity, diabetes, and other chronic diseases with a dose of powerful medicine: active design. FitNation brings together for the first time 33 projects in 15 states and the District of Columbia that showcase the ways design, policy, and grassroots strategies are promoting physical activity as part of daily life. The opening of the exhibition and Lively Steps will take place from 6 to 8 PM on Friday, February 13 at the Miami Center for Architecture & Design located at 100 NE 1st Avenue, Miami, Florida 33132.